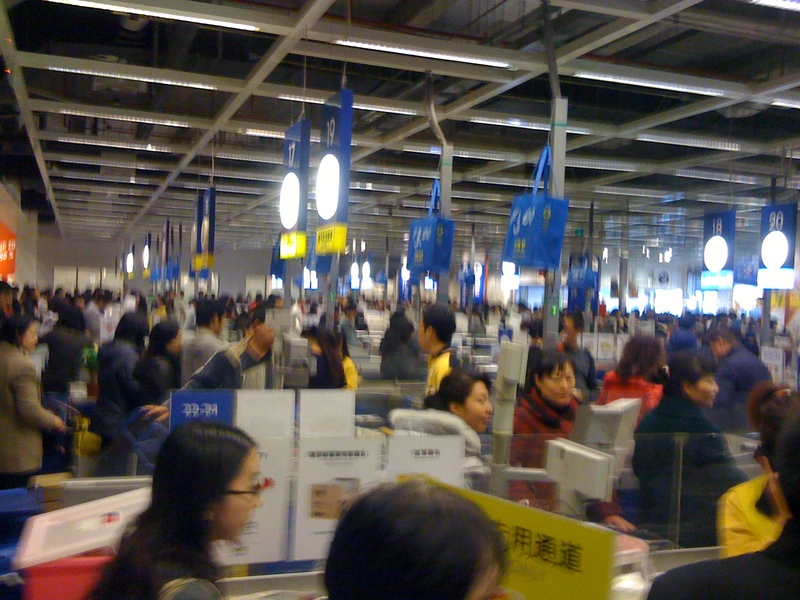 I wish someone would have warned me not to go to IKEA on the weekends, because this is what you deal with. Remi’s furniture and household goods are still on the boat, so we needed a few things to tie us over until they arrive. One fork and a bowl wasn’t really cutting it. One too many trolleys to the legs for my liking and I kept my mouth closed so not to freak out Elaine (just yet) or end up in the big house for manslaughter. Courtesy is not high on the agenda over here. To top off an already painful experience, I had a few too many vino rosso’s last night, and feeling considerable pain today. We went to a funky little place called The Room, Park Hyatt hotel, it was a creative masterpiece. The food was average but the ambience and quirkiness of the place made up for it. 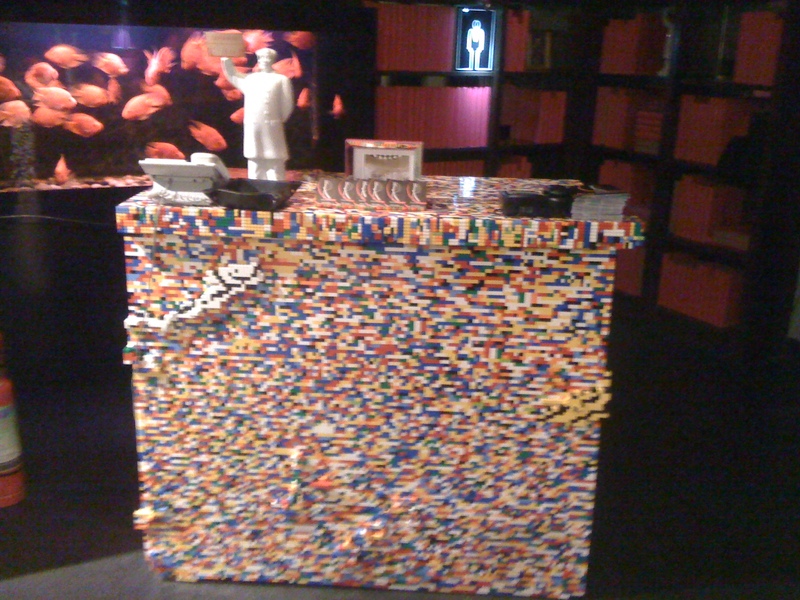 The first surprise was this really cool lego desk – Remi got a bit happy in the pants when he saw it, being a massive lego freak! More surprises when I went the “eau de toilette” and found that the little girls and boys rooms were hidden behind what looked like book shelves. Not an ordinary book shelf, they open and you get led into a room that looks like a library, with the walls totally covered in books. Lion, witch and wardrobe styles. A little chinese lady then opens another secret squirrel door and finally you see the bathroom – and can I say, you could eat off the floor. It was very Beyonce and Jay Z in there, complete with a wee little bidet hose to clean yourself very nicely. Sorry no pics, as I mistakenly didn’t take my camera to the loo – what was I thinking! Unfortunately, the food wasn’t that great and not only did they make us order our dessert and coffee with our mains but they then tried to serve us coffee and dessert with our mains – the polite way to tell us to bugger off. Then we got the bill …. As if the few bottles of wine we consumed wasn’t enough, we then tried meandered off to Xiu (pronounced ‘shoe’ lol). This is one of the coolest night spots I’ve seen and it was pumping! The beats coming out of that place were cranking and the people in the line were pretty much off the catwalk. The line up was more than we could bare so we latered it and went to another hotel bar for a night cap. I drank brazillian pinga which had me flying (thank you Flavio and Paula), and then I just sat there watching old men pick up young ladies and take them for a wander – classy. Too much pretty woman for me, so we called it a night. p.s – shout out to Optus for really screwing up my SIM card, locking my iPhone rather than unlocking as I asked ! My chinese doesn’t work and my Optus SIM is now locked. Optus, you rock my socks off.